Raymond William Barks played and coached hockey the way he lived his life: always at 110 percent. This Bobby Orr Hall of Fame inductee was born on July 22nd, 1936 at St. Joseph’s Hospital in Parry Sound, the only child of Thora and Raymond Barks. Though his family lived briefly in Toronto, Raymond and his mother moved back to Parry Sound when he was a little boy where he spent most of his childhood tumbling around the shores of Depot Harbour – rarely indoors and always up to something. Raymond was a mischievous child – eating wild leeks with his friends so they’d be excused from class due to the excruciating odour, or stealing a railroad handcar with a buddy. Fishing, ice fishing, and skating, he loved all kinds of sports, hockey most of all. For Raymond, it was pick up games on Georgian Bay using a crushed Carnation tin as a puck, and Eaton’s catalogues as shin pads. When his children were old enough to play the sport, he would recreate the same experience for them in their backyard on Highland Crescent, flooding the neighbours’ yards on both sides to construct an outdoor rink that was 40 by 85 feet. 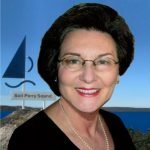 As a child, Raymond attended Thornton Public School in Depot Harbour and high school first at Central School, in the same location as William Beatty Public School today, and then at a newly constructed Parry Sound High School at its present location. There he played soccer and other school sports, but it was hockey that held his heart. At 14, he stepped onto the ice for his first ever game of organized hockey. Back then, teams were divided into the six regions of Parry Sound and named after NHL clubs. Raymond was a member of the Maple Leafs, and went on to play rep hockey as a bantam and midget, reaching the All-Ontario Juvenile finals in the 1953-54 season. He played intermediate hockey into his late teens. Raymond’s first job was for Sprunt’s Beverages, a local beverage manufacturer on Church Street. To stay in shape for hockey, he would run to and from work everyday from his home near Victory School where the family now lived. After meeting his wife, Rita, they married in 1959; just three years after Raymond started a job at A&P. He worked at the supermarket for 35 years, climbing through the ranks to produce manager and finally retiring in 1997 due to health reasons. As Raymond’s career developed, so too did his magnanimous spirit. Raymond joined the Parry Sound Volunteer Fire Department in 1962 and volunteered for 27 years, becoming a captain before his tenure was over. Around 2000, Raymond became the organizer of the Heart and Stroke Big Bike Ride in town. It was his job to organize the event and inspire and encourage each 29-seat tandem bike team to raise as much money as possible for the charity. A stroke victim himself, Raymond took his new role seriously. He lived by the model: “What you put into something is what you’re going to get out.” With his passion and drive, along with generous donations from the community, funds raised with the charity jumped from $2000 to $40,000 within four years of Raymond at the helm. He always referred to Parry Sound as the town with the big heart. 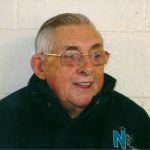 Raymond started coaching his eldest son Jeff in minor squirts in the early 1960s and coached local rep teams for 12 years, imparting his love of the sport to hundreds of children – novice, atoms, peewees, bantams – always expecting the best of them. 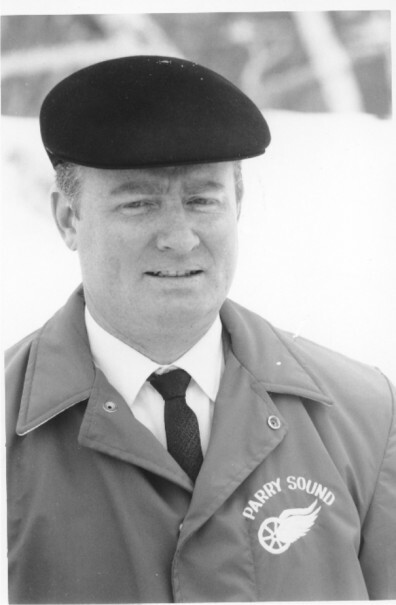 Raymond Barks was the first name Norman Bradley thought of when he was head coach of the Parry Sound Minor Hockey Association and looking for rep coaches. Brian McLeod, Brian Emery, and Todd Beasley were just a few of these kids. That’s one of the reasons why John Morel nominated Raymond for the Bobby Orr Hall of Fame. Like Brian, Raymond had coached John since he was a child and, over the years, became a close friend. 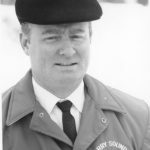 In the 1970s Raymond became head coach of the Parry Sound Minor Hockey Association, and oversaw the coaches of each individual rep team from novice to juvenile, setting up the systems for the teams to follow. Fellow coach Rod Dixon remembers Raymond’s commitment and how he was a devoted coach. After a three-year break, Raymond spent five years, from 1980-1985, as head coach of the Junior C Shamrocks, teaching the young men important lessons both on and off the ice. “Quitters are never winners and winners are never quitters,” says Kevin, recalling a favourite saying of his father’s. Raymond practiced this not only in his coaching, he also devoted his life to the principle. Raymond leaves behind a striking legacy, none of which would have been possible without his wife, Rita. Rita didn’t just accept his passions, she supported him in living and breathing them, while raising two boys who have grown up to respect and revere the memory of their father. Even after the big three, as his family calls it – a quadruple bypass, stroke and prostate cancer – Raymond couldn’t be slowed down. 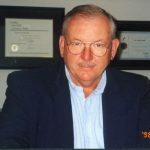 In his later years, he enjoyed golfing, fishing, and snowmobiling with long-time friend Terry Anderson. The two met playing old-timer hockey and, once they both had retired, spent almost every day of the week together. He loved to ice fish with as many grandchildren as possible (the more that came with him, the more fish he could keep) and enjoyed watching Josh, now 23, Joey, 21, and Brody, 17, play hockey, while coaching from the spectators’ bench. He and Rita could always be counted on to watch Jacki, 16, skip or 15-year-old Brittlee figure skate and the pair would never miss school concerts or sports. The morning of the day he died, Raymond Barks drove down to the Bobby Orr Community Centre, laced up his skates and played his last game of pick up hockey. A few hours later, the 69-year-old laid down for a rest and suffered a massive heart attack and passed away on Christmas Eve 2005. “He passed away content after playing the game he had a deep passion for,” says Rita, recalling the funeral where hundreds of people attended to pay their respects to a giving icon of our generous community. According to his family, Raymond truly touched people from all walks of life. His wife Rita and his sons Jeff and Kevin accept this award on his behalf. His grandchildren are extremely proud as are his daughters-in-law Cec (Jeff) and Kari (Kevin). Raymond would have been so proud and honoured to have his dedication recognized by a community he loved being a part of.